After an unusual previous day, nothing could prepare us for possibly the best day ever! From Curiel we drove back into the centre of Penafiel where we booked into the absolutely superb four-star Las Claras hotel situated in the heart of the town. The hotel was buzzing with people, lovely staff, great rooms, beautifully decorated, the biggest pool I had seen in a hotel, a fantastic spa and apparently superb restaurant, all for a very reasonable price indeed. 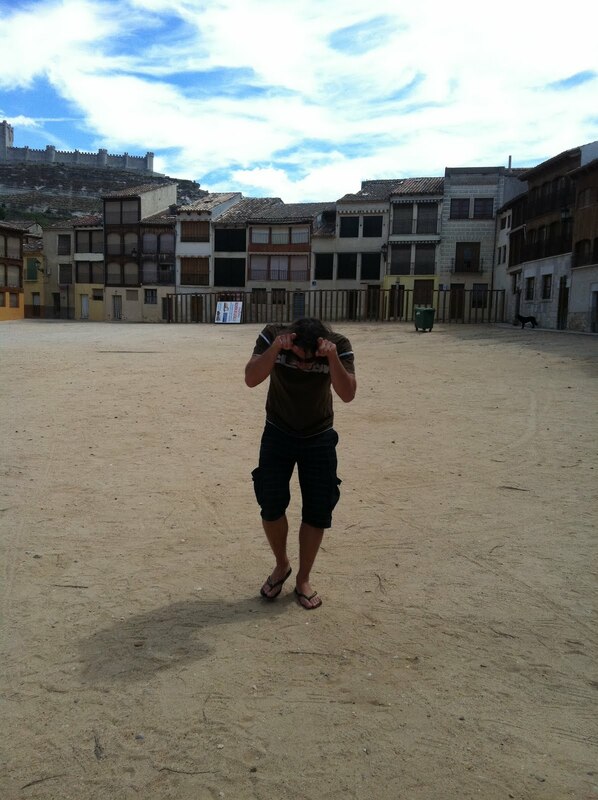 I had heard about ‘Lechazo’ – a speciality dish of the region – for a long time but had never tasted it. 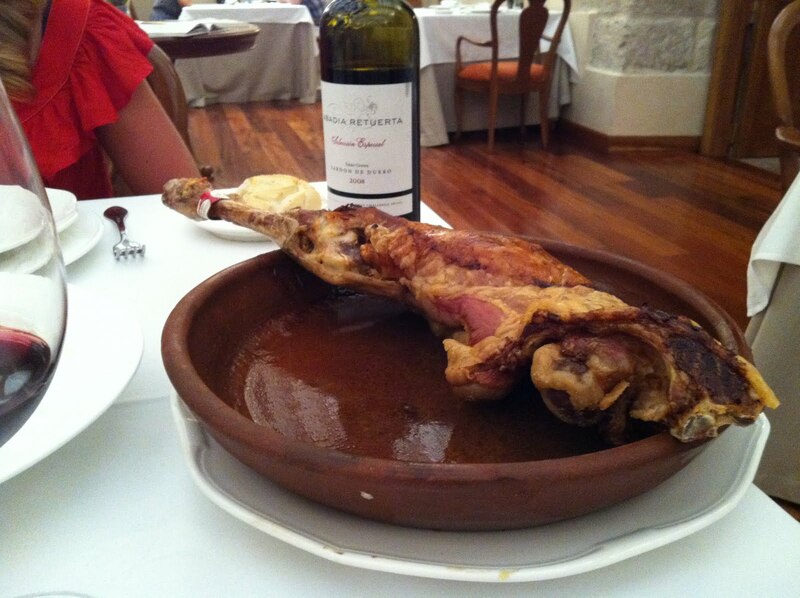 Lechazo is slow cooked lamb made from “cordero lechal" – lamb reared solely on its mother’s milk. So with some advice from my Spanish friend Jose, I was apparently to book the restaurant and the lamb dish at midday to eat the same evening, so I did and was told to come to the restaurant and the dish will be ready for you at 9pm. Penafiel is a great little place but you have to explore and it DOES have a real and very old castle above the town. We wandered into town and found some great non-tourist tapas bars, lovely churches, clock towers, antiques shops and a great medieval bull ring in Coso Square, locally known as ‘el corro de los toros’ (and to save you looking all over town you’ll find the Tourism Office here too). There are many wine shops and vinotecas which are very hospitable and my recommendation is the El Placio del Vino where you can also taste wines. I discovered a lovely style of Verdejo here, a white wine, slightly sparkling with 7% alcohol and bottled with a beer cap. We were slightly unlucky with winery visits as it was Saturday in the month of July and everybody I was recommended was either hosting or attending a wedding! 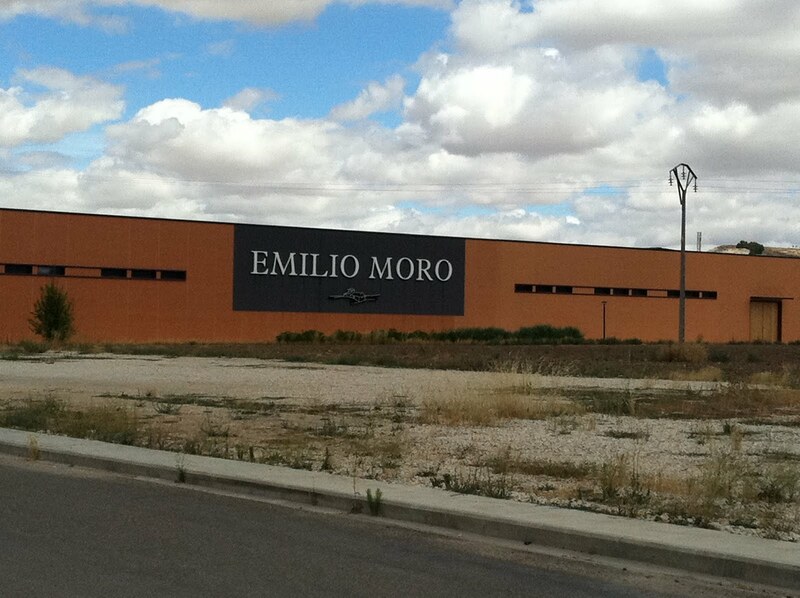 However I did manage to get a visit to the family run estate Bodegas Emilio Moro in Pesquera de Duero close to Penafiel www.emiliomoro.com. A very interesting Bodega and very good range of wines all made only from the local Tinto Fino grape, well worth a visit. 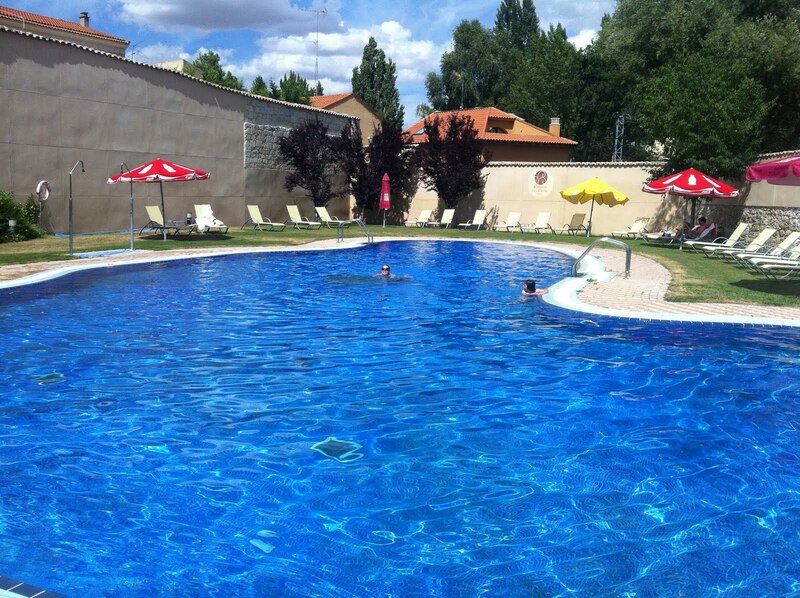 We arrived back to the hotel in good time and enjoyed the magnificent pool and the extremely good wine bar and its courtyard until dinner time. We arrived at the restaurant at 9pm as told, only to be told no lamb! Panic, devastation, sadness and anger was what I felt for about 30 seconds until realising that they meant the lamb actually wasn’t ready yet and to return in an hour! Phew! 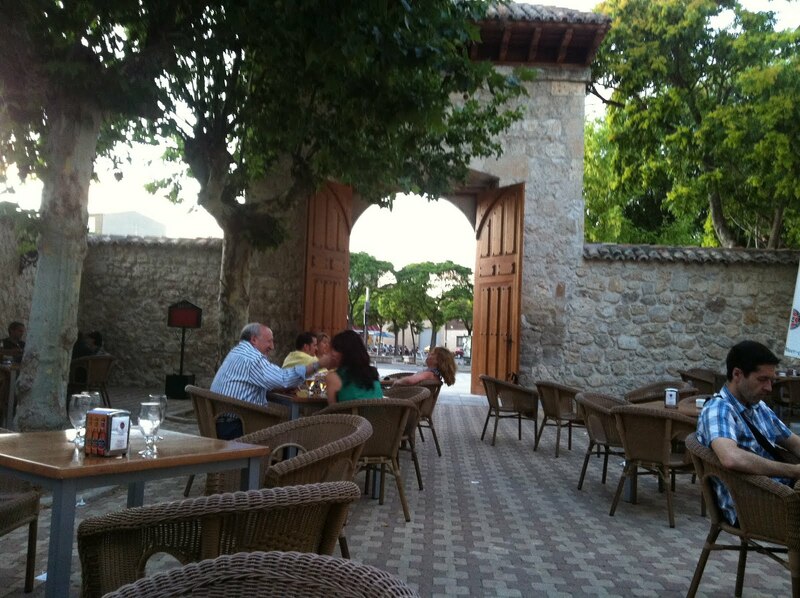 Time easily passed in the hotel’s great lounges and gardens and we were once more back at the restaurant where we were told our lamb was ‘perfecto’ and finally ready to be served, excitedly we hurried to our table. The next 10 minutes was one of my greatest foodie experiences, out came two people carrying a enormous leg of lamb heading straight for our table. As they entered the restaurant from the kitchen the most incredible mouthwatering aromas engulfed the room. And as they passed the tables of the now-full restaurant, people stopped eating and watched and drooled with envy at OUR lamb!! The waitress carved it up at the table and the crackling fell away from the succulent meat which was served, as advised, with a simple salad ‘ensalada’. The wine list was superb and with the lamb aromas sending me into a mad frenzy, I nearly ordered a Vega Secilia!! After gaining my senses and resisting (thanks to Libby) I chose a stunning and well priced Abadia Reteurta reserva 2008. The company, the wine, the meat and the restaurant was easily one of the best meals and experiences I have ever had. And it just shows simplicity is the best; salad, lamb, red wine (no starters or deserts)!